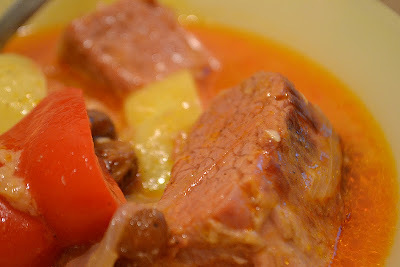 My wife decided to try using beef corned silverside for caldereta and it turned out really good. When you bite on the meat, you get that texture and flavour of corned beef, but the tomato-based sauce, sweet raisins, and creamy cheese all combine for that yummy caldereta taste. Perfect with hot, steaming rice! First off, the beef corned silverside needs to lose its saltiness. Give it a good rinse, then boil the meat over low heat for an hour. 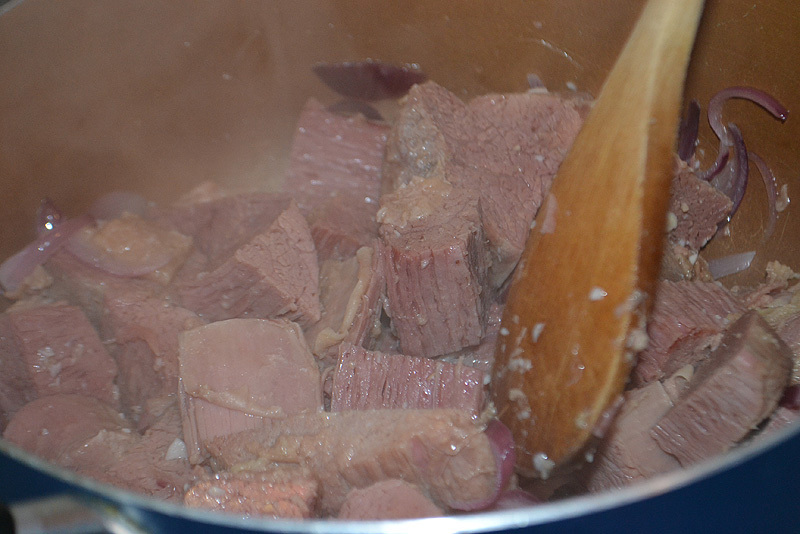 Use enough water to submerge the beef. Drain, then add a second batch of water. Resume cooking under low heat for another hour or until it becomes tender. Set aside the water (which will now be your stock), and chop the meat into chunks. 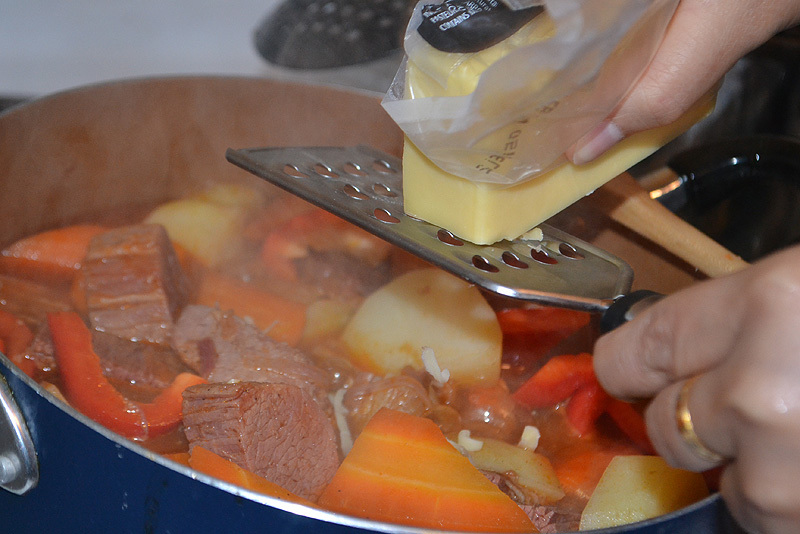 While waiting for the beef to cook, start with preparations of the veggies. Just fry the potatoes, carrots, and capsicum until half-cooked. Set aside. Pour a couple tablespoons cooking oil into the pot over medium heat. Saute the onion and garlic. 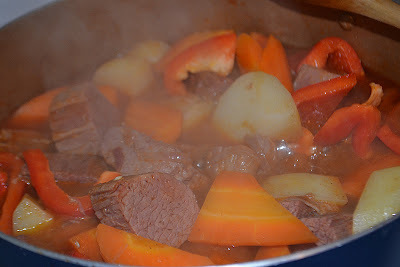 Add the beef and mix. 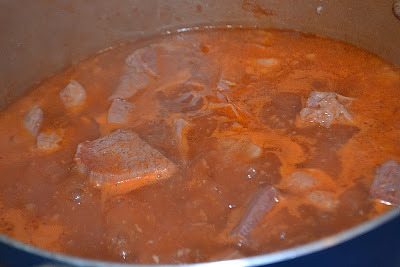 Next, pour back the stock, and add the tomato paste and tomato sauce. Stir and let boil. Next, add the veggies and combine. Since the veggies have been half-cooked, just wait for a couple more minutes and then grate the cheese and add the raisins. Mix and taste, adjusting with salt and pepper. Add more grated cheese if you wish.